Kaizen is a Japanese term coined in the period after World War II when businesses were trying to cope with the effects of the war. "Kai" translates to the word "change", and "zen" means "good". Essentially meaning "continuous improvement", kaizen targets human resources and processes so as to anchor an industry for long-term and successful operation. Kaizen produced significant results for companies like Toyota, and has become a popular production philosophy all over the world. Kaizen aims to raise efficiency and productivity, but it does so by promoting a healthy working environment for employees. This, in turn, creates an organized and creative work environment that enriches the company, employees, and the services rendered to the consumer. Kaizen works in a cycle that it requires cooperation in all departments, and may even extend to suppliers. A prominent example of Kaizen is the implementation of a process called PDCA cycle. This is the Plan, Do, Check, Act method. The first step in PDCA is execution of the plan and accumulation of data, which will be used later for comparisons. When results are achived, they are then checked and compared to the expected outupt. The results are then discussed and refined, to come up with a new plan. The application of the new plan is the last step of the cycle, then it begins again with tests and data accumulation. If the process is recurring and the data is measurable, then every cycle leads to improvement. PDCA is a repetitive method and guarantees that knowledge of the production process will increase, and thus result in improvements. This is a perfect example of Kaizen, as improvements are cyclic and continuous. 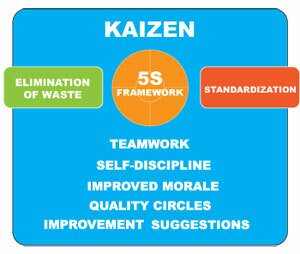 Kaizen is built on a 5S framework with elimination of waste and standardization at the forefront, and it contains elements that must be applied for the system to be effective. These elements are teamwork, self-discipline, improved morale, quality circles and suggestions. While most of these terms are fairly straight-forward, "quality circles" is a term new to a lot of people. Quality Circles and Suggestions are two of the main forces behind the success that Toyota has had with Kaizen. Quality Control Circles are teams that focus on identifying, analyzing and proposing solutions to work problems. It is composed of students and/or workers with a team leader, and encourages development and expression of individual ideas rather than delegating individual jobs. This helps to focus on resolving problems, rather than pointing fingers when a mistake is made. Japanese businesses usually consider a production line as an already etablished quality circle in that the quick identification of a problem in the first phase of production can reduce major problems down the line. Each worker is provided training on trouble-shooting abnormalities that arise in their work station. If each stations executes qualithy control, reduction of expenses and time creates an impact. Because Kaizen is built on a 5S framework, there are many visual cues that are helpful with a Kaizen philosophy. Check out some of our 5S items, as well as Kaizen Lean Training videos. Get your FREE KAIZEN Guide for a comprehensive Kaizen resource.